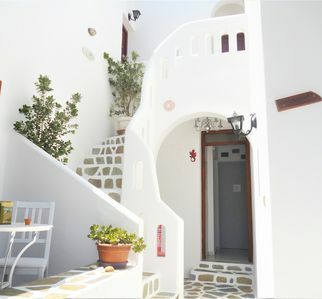 A Unique Acropolis views apartment located on the 6th floor. 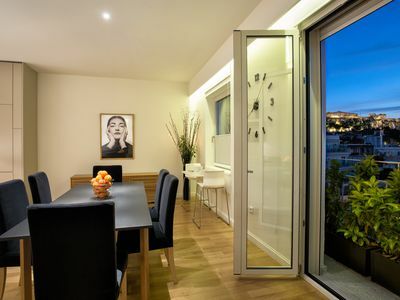 This sophisticated newly refurbished apartment lies in the heart of Athens to give you an authentic experience of the city. 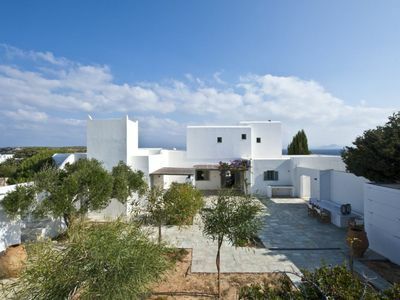 Enjoy its unique panoramic view of the Acropolis while sipping on a glass of local Greek wine. 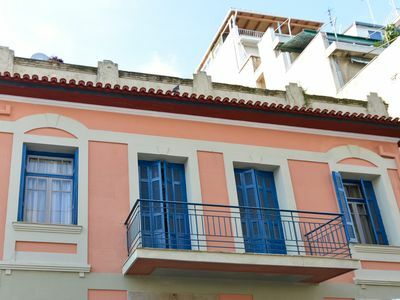 The apartment is situated on Pentelis street, at the beginning of Mitropoleos Street, and is just a few steps away from Syntagma Square, the most famous square in Greece. 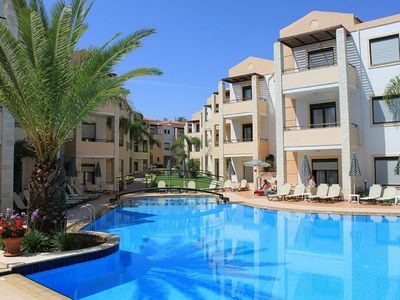 Numerous tourist attractions and historical monuments, such as the Acropolis, Acropolis Museum and Plaka area are within walking distance of this apartment. 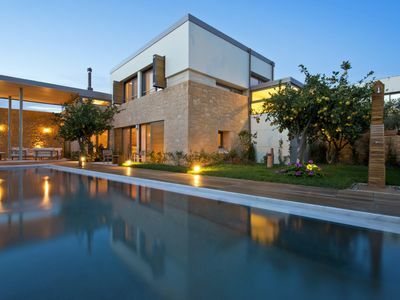 It is also close to Ermou Street, the main shopping street of Athens, and only five minutes away from the upscale neighborhood of Kolonaki, where you will find exclusive designer shops, boutiques, nightclubs and some of the finest wine bars in Athens. 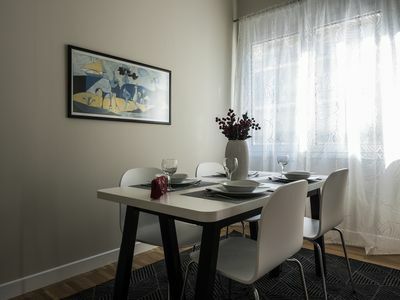 Multiple bus stops and the Syntagma square metro station are in close range to the apartment, providing you with easy access to the entire city. 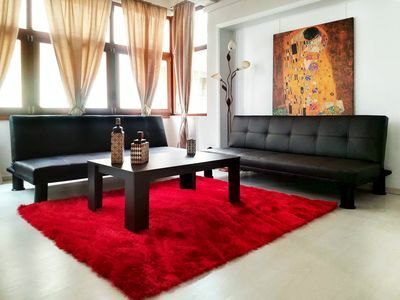 This spacious apartment (180 sq.m), is located on the 6th floor and is accessible by both elevator and stairs. 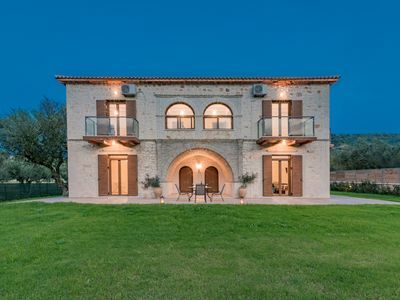 Its position on the top floor of the building offers a spectacular view of the Acropolis which can be enjoyed from inside or from the balcony. 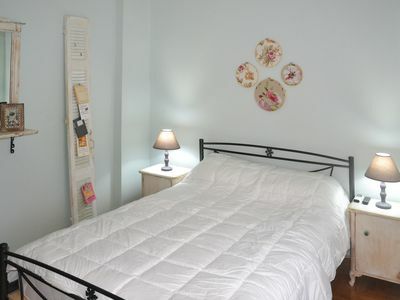 The apartment is designed to comfortably accommodate up to 4 guests. It consists of 2 separate en-suite rooms: The master double bedroom with a walk in closet and a double Bedroom (twin double). The apartment also has a fully equipped kitchen, a dining area, a study room with a library and a large living room. The master bedroom is an ideal retreat to help you unwind after exploring the city of Athens. The room includes an ample walk in closet, a private balcony, a king size bed, a flat screen TV and an en-suite bathroom with a walk in shower. The second bedroom comes with two twin beds, 2 large closets and an en-suite bathroom. Linen includes fine cotton sheets and towels, which are washed and ironed by a professional cleaning company. Both bathrooms are equipped with toiletries, hairdryers, bathrobes and a magnifying mirror. The entire apartment is fully air-conditioned and can be set to your desired temperature. There is complimentary Wi-Fi use during your stay. No parking on property. 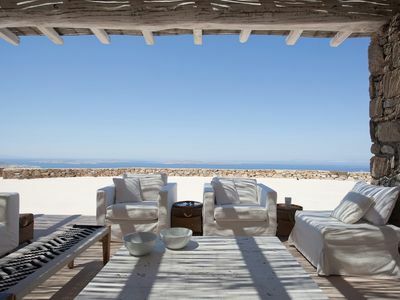 The guests are asked to respect the space by looking after it as if it was their own residence. This is strictly a non-smoking residency but guests can smoke at the balcony: armchairs and small tables are provided. There can be no more than 4 adult staying at the apartment at any time. This policy will be strictly adhered to. The guests are asked to turn off all Electrical Appliances, Equipment and lights when not in the Apartment. For guests that stay on for more than a few days, we kindly request that they take out their garbage. Large bins are located on the streets around the apartment building. We can indicate them to you. 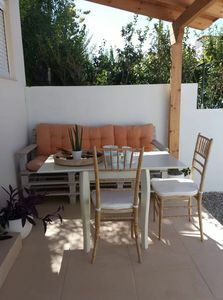 For guests that stay over 3 nights and require some supplementary cleaning services this can be arranged for an additional 50 euros to be paid in cash. We kindly ask guests to be tidy and mindful during their stay. If you are requesting for a cleaning service please indicate this during the booking process. If requesting for the specific service during your stay we will need 24hours notification and the service will be provided 12.00-16.00 upon arrangement. It is preferable for the best possible provision of the service be asked not to be at site during the cleaning procedures. •	Outdoor balcony on both sides of the apartment. Check out by 12.00PM (noon) – For late check-out (after 14.00) a full (1) one stay will be charged. Guests will be met at the apartment to proceed with the check in. 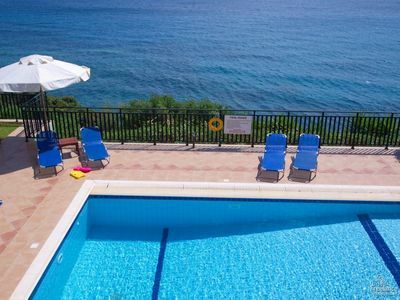 By making this reservation, you accept that this not a hotel or any other official touristic accommodation. This is a house and you are a guest. The host cannot be held responsible for any accidents or injuries that occur to guests on the premises. Guests are held responsible for their own actions if they break the law. Use of drugs inside the apartment is prohibited. The Greek law covers this agreement and any dispute will be subject to the exclusive jurisdiction of the courts of Athens, Greece. 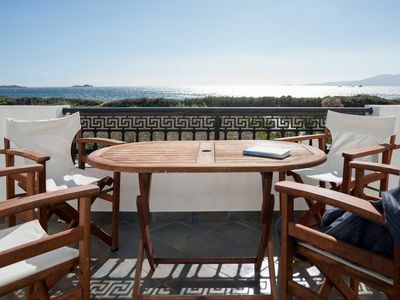 Stylish villa with spectacular sea views at a quiet location near the main town. 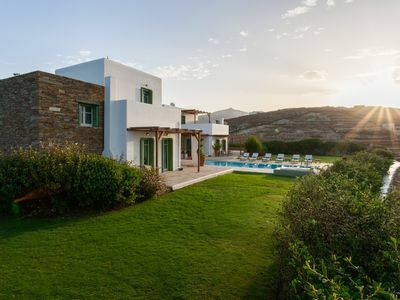 Villa Sandstone, beautiful stone built villa with amazing sea and sunset view by Elite Estates. 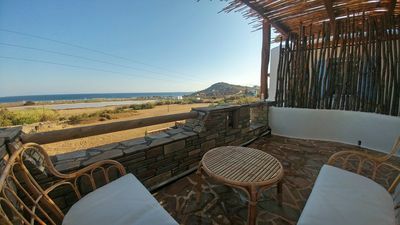 The studio Kedraki is an ideal place to relax and enjoy a wonderful stay.